What happens when you add an extra pair of wheels, a tow strap, and vibrant graphics to an ordinary suitcase? It becomes the ultimate wheelie bag for kids. Travel is a whole lot more fun when kids can scoot through the airport or train station on their own luggage. 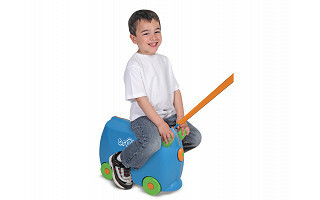 Distributed in the US by veteran toymakers Melissa & Doug, Trunki is a carry-on suitcase that doubles as a riding toy. There’s room inside for clothes, toys, books and all the usual travel necessities; kids will love discovering the four hidden compartments that are perfect for stashing secret treasures. A secure latch ensures the suitcase won’t spill open when your little one is riding around the terminal, and stabilizers help prevent toppling over. And if junior is too tired to scoot? The handy tow strap makes it easy for a parent to do the pulling. Trunki was a huge hit with our kid testers. All the thoughtful details make it fun for kids to take responsibility for their own stuff next time they head to a sleepover, overnight camp, or cross-country trip. And when you’re at home, Trunki is great for storing toys and dolls, too. What is the weight limit on kids using it as a ride-on? @Liz McMaster: They are made in the USA but do have some foreign-made components. What are the dimensions of the Trunki? @Barb: Great question. I am pulling this information (and a little more for anyone who is interested) from our details tab that is found under a product's video but above the story. - Dimensions 18.25" x 12" x 8.75"
- The Trunki is carry-on luggage approved. What is the best age range for the trunki? @Stacey: Hi Dee Trunki is suggested for ages 3-6 years old. But it really depends on the developement of the child. It can be great for toddlers to push around and for older kids to pull as well. what are the dimensions ? Does it fit underneath most airplane seats? @Dee: Trunki fits in the overhead bins and under most airline seats. They are Carry-On luggage approved. @Jayne McPherson-Young: Hi Jayne Thank you for your wonderful comments. Grandparents are such an important part of a child's life. Even if they can't ride on them anymore they can still pull them around like a pet or a wheelie bag and keep their treasure possessions in them. I bought my daughters two of these several years ago. We travel a lot together, and sometimes I'm the only one traveling with them. They have been a Godsend!! When they were smaller, my daughters would ride their Trunki's around the airport. You should see the looks we have gotten in airports all around the world! People are fascinated by these. My girls are now 12 and 9 years old, and they still take their Trunki's with them whenever they're traveling. My 12yo's Trunki still supports her weight. And while she no longer rides it around, she does sit on it when we're waiting in long lines. My older daughter still often pulls her sister along through the airport while her sister rides on her Trunki. The best thing is this: The girls know their Trunki's are their responsibility. Therefore, whenever we're getting ready for a trip, they get their Trunki's out and pack them themselves. I love this! They know if one of their toys, game or lovies isn't in their Trunki, then it's not coming along. They usually pull out their Trunki's at least a week in advance of a trip and start packing. The "secret compartments" are a danger spot, though. We've "lost" many small items throughout the years, only to find them years later in one of the Trunki's secret compartments. :-) Mostly they tuck coins and jewelry in the compartments -- they are very small! I would recommend the Trunki to anyone who travels with children. Even after traveling all over the world with them, my girls' Trunki's are still in the same shape as when we bought them. They are very durable! And they do fit easily under the seat in front of you, while still leaving quite a bit of room for little feet and/or a purse or stuffed animal. Hi Amber - Thank you for sharing your wondeful experiences with Trunki. I am glad that trunki is still serving you all well and teaching all the lessons we hope kids will learn in a fun way. Trunki is great for Travel, but there are also many everyday uses too! I am a psychologist in private practice who works with a lot of children who go back and forth to their parent's homes for visitation. I think that Trunki would be an excellent investment for parents with this arrangement as children will find the pleasant design to be comforting as well as practical. We went to England last spring and saw these all over in the airports there. I thought it looked like a great idea then and now I see someone else thinks so too. What happens when you add an extra pair of wheels, a tow strap, and vibrant graphics to an ordinary suitcase? It becomes the ultimate wheelie bag for kids. Travel is a whole lot more fun when kids can scoot through the airport or train station on their own luggage. 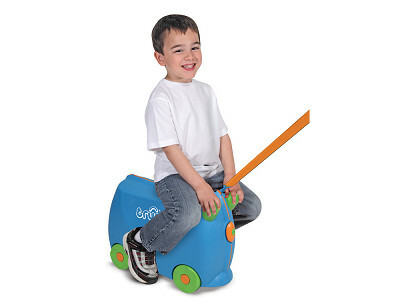 Distributed in the US by veteran toymakers Melissa & Doug, Trunki is a carry-on suitcase that doubles as a riding toy. There’s room inside for clothes, toys, books and all the usual travel necessities; kids will love discovering the four hidden compartments that are perfect for stashing secret treasures. A secure latch ensures the suitcase won’t spill open when your little one is riding around the terminal, and stabilizers help prevent toppling over. And if junior is too tired to scoot? The handy tow strap makes it easy for a parent to do the pulling.